Clearwater Beach Florida – Doing a 1031 Exchange in Florida is a useful way for Clearwater Beach real estate investors and all Florida real estate investors looking to sell a condo in Clearwater Beach or any of our other beach towns and avoid paying the IRS capital gains tax while still increasing their wealth with smart investments. 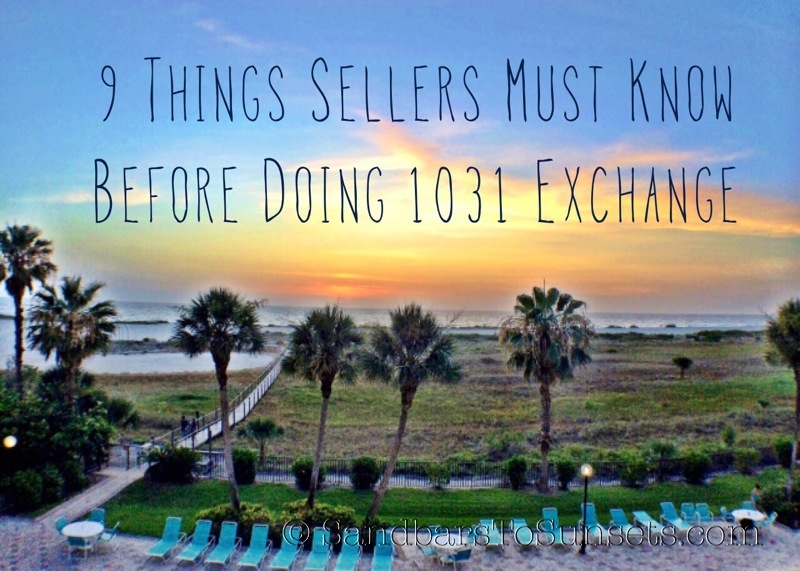 We put together a quick list of 9 things home sellers must know before doing a Florida 1031 exchange on their second home or investment. 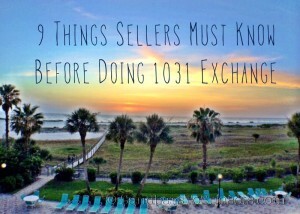 If you’re curious What is a Florida 1031 exchange you may want to check out this article first > Clearwater Beach Real Estate – What is a 1031 Exchange? However, the practice is filled with potential pitfalls that can cause inexperienced investors or Realtors® to fail to meet its exacting conditions, resulting in the real estate investor being taxed on their capital gains. Working with a top Clearwater Beach real estate agent experienced with 1031 tax deferred exchanges in Florida when when buying or selling a property in Clearwater Beach by with navigating past the pitfalls, but it is important to note that a Florida 1031 exchange is best conducted with a team of experts at each step of the process. We can introduce you to all the local specialists you’ll need. One of the most important consequences of the loosening of restrictions is that Florida 1031 exchanges no longer have to be simultaneous, meaning that investors can now use intermediaries. To sum up the process, 1031 exchange Florida investors entrust their properties to the intermediaries, who then proceeds to sell the property and holds on to the cash for their clients. This is important because the real estate investors cannot collect the cash from selling their property without incurring the IRS capital gains tax. Once the assets have been sold, the investors have limited time with which to identify the replacement assets, which the intermediaries will purchase using the proceeds of the sale. Once someone has closed on the property sale entrusted to the intermediaries, the investors have 45 days in which to identify new assets with which to replace said assets. In practice, this means that investors in the real world often have more than 45 days with which to identity suitable replacements, since the timer does not start running until the closing period has concluded. Standard practice is for the investors to provide the intermediaries with the information on not just one suitable replacement properties but up to three so they have two back-up options. Please note that the intermediaries have a time limit of 180 days in which to close on the like kind property sale meant to replace the original property or assets entrusted to them. This timer also begins running as soon as someone closes on the first property entrusted to them. Investors may not want to identify suitable replacements as soon as possible for a couple of reasons. First, waiting a little means that more may be listed for sale, thus providing the real estate investors with additional options and thus additional possibilities. Second, the investors’ power of persuasion relative to the owners of their replacements increases once their assets have been closed upon. Finally, “like kind” means that the assets or properties are similar in character without regard to differences in excellence. This means that office buildings can be traded for either a Clearwater Beach condo or land or apartment buildings or even shopping complexes. However, it is important to note that “like kind” assets must be either an investment or a non-inventory asset that is not being held for the purpose of resale. Of course, these facts only give a small glimpse into what you need to know to sell a condo in Clearwater Beach and do a Florida 1031 exchange. Ask me about issues with funding renovations and improvements which can definitely make a big difference in older beach condos on Sand Key for example. Investors without extensive experience with such practices should not hesitate to contact local 1031 Real Estate Specialists like us for skilled and experienced assistance with their 1031 especially when selling because you need to hire a Realtor® that can market your vacation home / investment property and understand to the right buyer they are buying more that just real estate. What’s the biggest mistake we see people make in real estate? Buyers and Sellers not realizing you don’t know what you don’t know and what you don’t know can be very costly especially when it comes to 1031 tax deferred exchanges of when you sell properties anywhere in Tampa Bay however I don’t have to tell you the best returns are typically found with short term beach rentals. Feel free to give us a call or text at 727-710-8035 if you’d like to discuss your particular situation since each situation is unique.